Our two sun bears arrived at Colchester Zoo in September 2010. Both bears were confiscated by Government Anti-Poaching Patrols in Cambodia in 2007 and 2008 respectively. A lot of time, money and thought went into their modern enclosure, and also into making sure that our sun bears have a home suiting all of their physical and behavioural needs; providing an exciting and diverse habitat. Jo-Jo and Srey Ya have a large outdoor area for them to explore, along with an indoor area consisting of a waterfall and climbing frames for enrichment. Both the indoor and outdoor areas for our sun bears have public viewing areas, but Jo-Jo and Srey Ya also have the opportunity to retire to their own private, off show, sleeping quarters. Both bears were confiscated by Government Anti-Poaching Patrols in Cambodia in 2007 and 2008, with Srey Ya found in a village, weighing just 300 grams so young she had not yet opened her eyes when she was confiscated and also suffering from pneumonia. Jo-Jo was rescued from a bar where he was being kept as a pet to amuse visitors at just 6 months old. 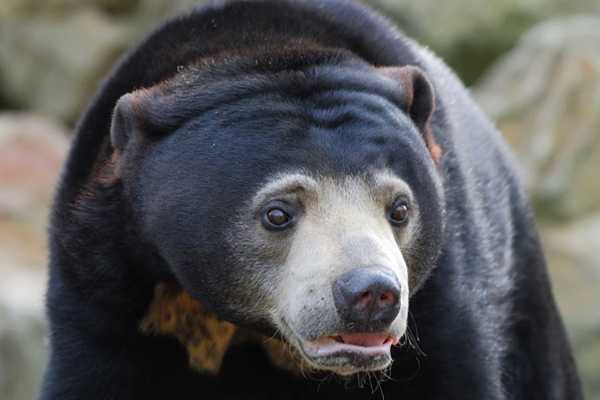 The sun bear, also known as the dog bear or honey bear, after its love of honey, is the smallest of the eight bear species. It is black with a golden crescent marking on its chest which, in ancient Eastern folklore, represents the sun.